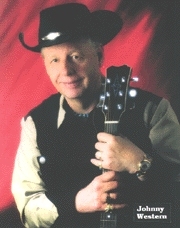 After 64 years and 4 million miles on the road, Johnny Western retired from touring at the end of 2013. 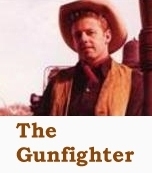 He will do one or two special projects a year, as he did with the "Marty Stuart Show" for RFD-TV. Johnny was interviewed in Hollywood for a 90-minute documentary on Johnny Cash for Network Entertainment of Canada, "Johnny Cash, American Rebel." Keep checking this website for the release date for TV and theaters. Johnny worked with Cash for over a 40-year period, on the road and in the recording studio. He played guitar on 71 singles and five albums for Columbia Records. 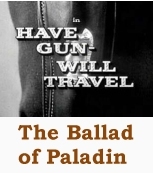 Hear Johnny sing "The Ballad of Paladin" on Have Gun, Will Travel, airing twice daily on H & I (Heroes and Icons) weekday mornings and on MeTV weekend mornings. 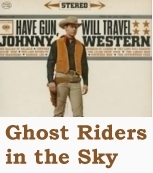 This classic Western features Johnny's iconic theme song, which he wrote for CBS-TV on March 14, 1958. The show's 225 episodes have been seen by more than 500 million people and have never been off the air, running somewhere in the world for the past 56 years. Thanks to all who've tuned in during those years! YouTube is a great resource for Johnny's work. Each CD is $20 (with free shipping) and includes a personalized autograph from Johnny. Click here for ordering information.